Celebrating their tenth anniversary season, local Melbourne company OSMaD serves up another pristine production. The gorgeous music of Chess is heard at its very best with a 22-piece orchestra, strong leads, large chorus and pit singers. Written at the peak of the British mega-musical era, Chess may not have achieved the more enduring success of counterparts such as The Phantom of the Opera and Les Misérables, but there is no denying the lasting beauty of its rapturous score. Benny Anderson and Björn Ulvaeus penned sumptuously romantic ballads and duets, crossing deftly between light rock and operetta. 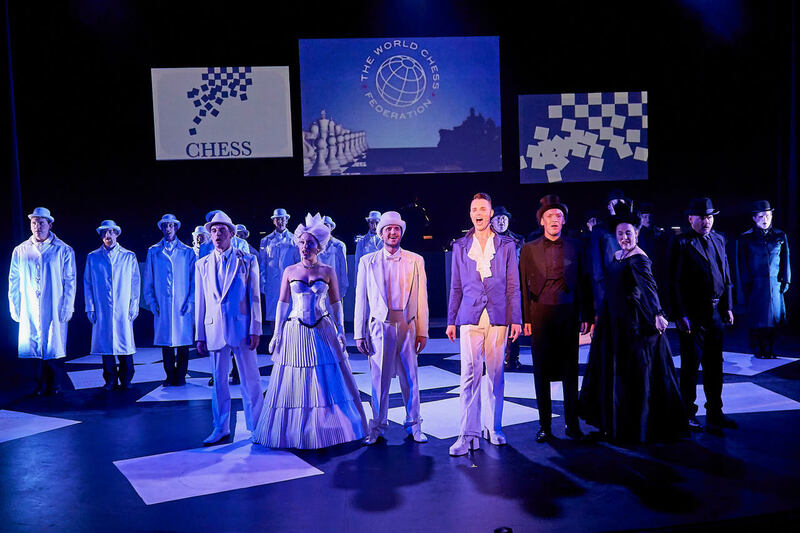 In line with the mega-musical style, Chess is through-sung, and while Tim Rice’s lyrics may be excellent, the cohesiveness of the book has long been the show’s weakest attribute. Unlike almost every other licensed musical, Chess gives producers explicit permission to tinker with the book. The 2008 staging of Chess in Concert improved the story’s clarity greatly. This production, which uses all the snippets of dialogue, including some tweaks by director Alan Burrows, nails the storytelling, presenting the show as the gripping drama it was always intended to be. Using the game of chess as an allegory for political machinations, Chess puts a personal face to the implications of the Cold War, pitting an American champion against a Russian contender who later defects. 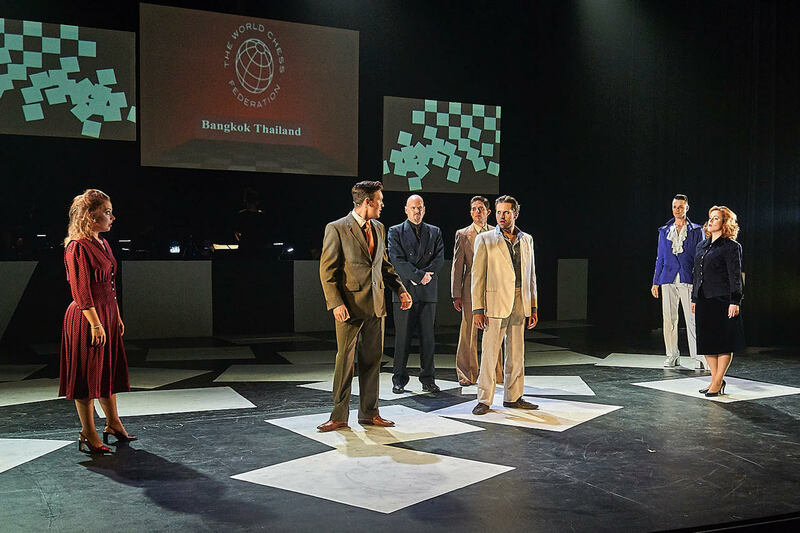 With the support of his creative team, Burrows begins the show in striking fashion, outfitting the company as black and white pawns as the Arbiter tells “The Story of Chess.” Even those unfamiliar with the show will discern that the prologue’s king, queen and rook in white and black are to be the key characters of the night. Not only does this opening sequence make a strong statement about the direction of the story, it also makes immediately clear the very high quality of the music. Setting aside the fact that a professional production can cast the best available singers as leads, OSMaD’s combination of lush orchestra, exacting musical direction (Martine Wengrow), superb chorus and pit singers and excellent sound design (Glenn Bardwell) make this the best choral performance of Chess I have heard to date. When the chorus returns for the second number in a complete costume change, and then another, and then another, it soon becomes clear that costumes are to be a key highlight of the production. Costume designer Katrina Stanley has assembled an incredible array of outfits, channelling many of the colourful excesses of the 1980s (the Russian, Anatoly, seems to be the only one who has missed out in this regard). Highlights include the festive Tyrolean costumes of the residents of Merano, the Arbiter’s frilled electric blue jacket and glossy white platform shoes, and Florence’s extensive chic wardrobe. Having costumes as a feature while the set remains mostly static proves a wise choice. Multiple locations can be suggested with costumes, and changes of furniture, on a scale that would be difficult to achieve with full sets. 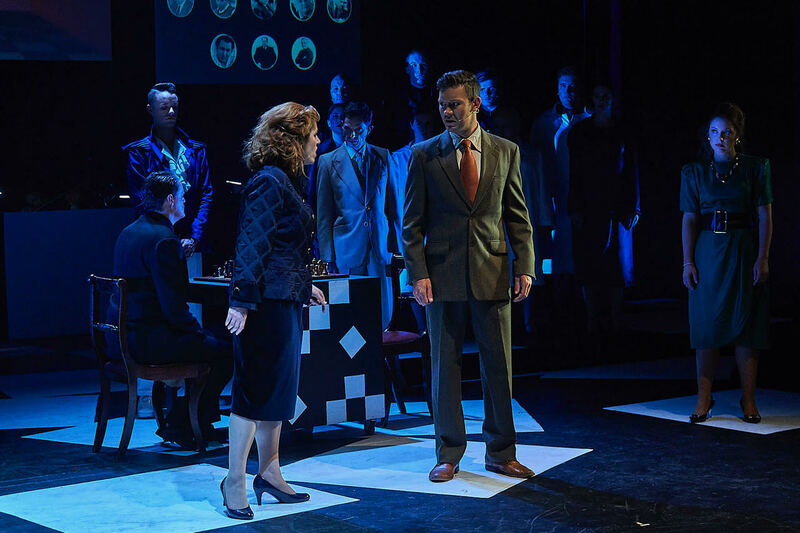 David Dare’s set design has the orchestra upstage and the floor and orchestra wall painted boldly in a reproduction of the musical’s original marketing image of orderly chessboard squares falling into chaos. Dare supplements the stage design with three overhead screens. These not only aid the storytelling by displaying images relating to time and place, but Burrows also makes canny use of the ability to show video footage. From their hotel room, the Russian camp watch footage of American Freddie Trumper shoving the press; during “1956 – Budapest is rising,” black and white archival footage expands on Florence’s explanation of the hell her family endured at the hands of the Russians; when Anatoly’s wife Svetlana is introduced, home movies show the happy family he has left behind to defect from Russia and be with Florence. As just one facet of her exemplary musical direction, Wengrow slightly decreases several tempi to successfully bring more clarity to the lyrics. I have heard the score countless times (both live and recorded), and there were some phrases I understood for the first time in this production. 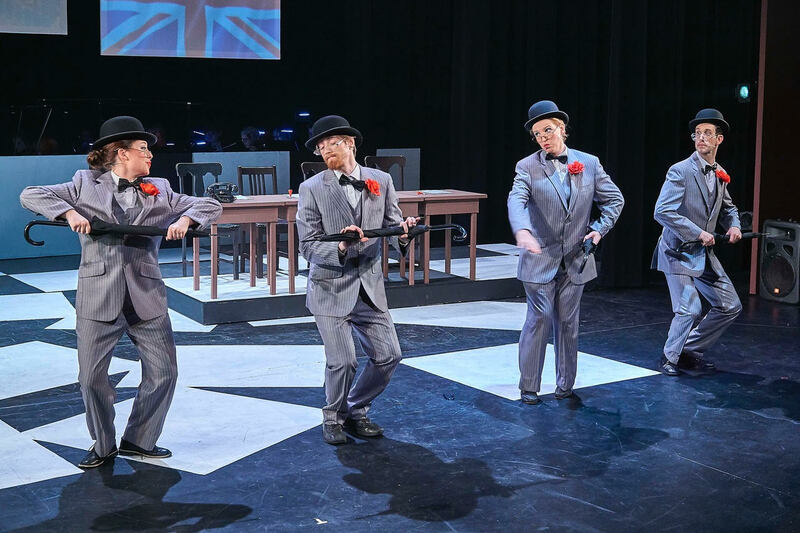 Choreographer Dianne Crough adds significant visual impact to the staging, not only contributing lively choreography for the big chorus numbers but also enhancing smaller scenes with additional movement. Crough proves adept at a wide range of styles: the company frolics merrily in “Merano,” the “Merchandisers” have the vigour of a pep rally, and “The Arbiter” has the style of a 1980s music video clip. The use of dancers during the matches “Chess #1” and “Chess #2” is perhaps a little distracting, but nonetheless quite beautiful. Graduating from ingénue roles, Emily McKenzie gives a performance of great maturity, depth and flair as Florence Vassy. McKenzie brings a vulnerability to a woman who could be seen as self-serving, raising the stakes of her romantic attachment to Anatoly and making Florence’s quest to find her father all the more believable and affecting. McKenzie’s rendition of hits such as “Nobody’s Side” and “Heaven Help My Heart” is a pleasure to hear. As Russian Anatoly Sergievsky, Owen Clarke captures the imperturbable façade of a champion chess player, keeping the man’s dilemmas bubbling just below the surface. Clarke’s performance of classic tenor ballad “Anthem,” which closes act one, had audience members still swooning at interval. Robbie Medica throws himself wholeheartedly into the role of American Freddie Trumper, an unlikeable lead character if ever there was one. 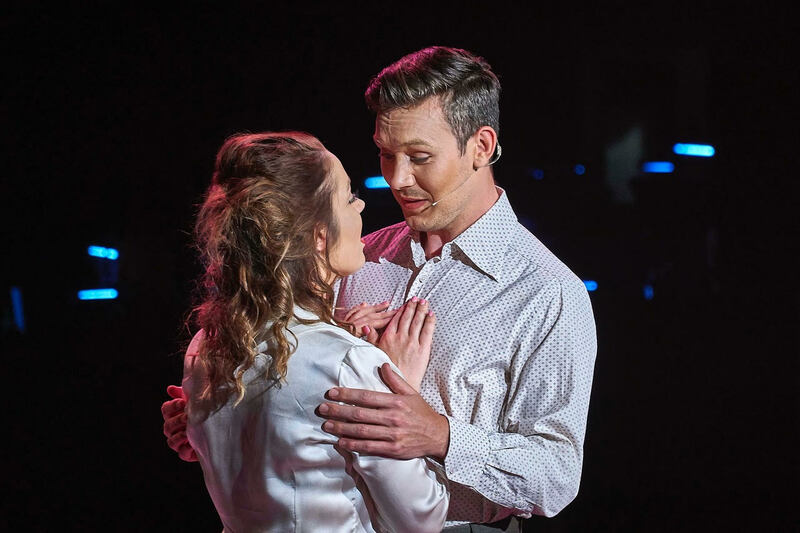 In a role that is almost un-singable, a few of the very highest notes are a bit of a strain for Medica, but his overall singing in the role is very good. In Medica’s performance of “Pity the Child,” which reveals a sympathetic back-story for Freddie, he still retains a hard edge to the character rather than indulge in melodramatic angst. Ian Frost brings his highly characterful expression to the role of American television executive Walter de Courcey. Nic Russ has pizazz and presence to spare in his glamorous incarnation of The Arbiter. Zak Brown, surely Melbourne’s best non-professional bass baritone, pours forth his powerful, deliciously burnished vocals as manipulative Russian schemer Alexander Molokov. After just catching a glimpse of Candice Sweetman in the prologue, we are kept waiting until act two for her true entrance as Svetlana Sergievskaya. Anatoly’s wife is unearthed by Molokov as a means of controlling the result of Anatoly’s performance in the world championship game in Bangkok. Sweetman portrays Svetlana as a staunch survivor rather than a victim, making her a worthy adversary for Florence in their competition for Anatoly’s affection and attention. Sweetman’s delivery of choice ballad “Someone Else’s Story” is wonderful, and when Sweetman and McKenzie combine for classic duet “I Know Him So Well,” the result is quite extraordinary. The review would not be complete without another mention of the outstanding work of the ensemble. The choral singing is magnificent, and the amount of acting and dancing also performed by the chorus in a wide range of roles is extremely impressive. Chess plays at Geoffrey McComas Theatre, Melbourne until 28 October 2017.